Are your sustainability efforts making as much impact as they could be?With our collective way of life rubbing up against the natural limits of the planet, it does not take a genius to see that it is time to scrape the mud off our boots and find a shorter, smarter path towards sustainability – a way to maximize our effectiveness and inspire leaps forward in sustainability, rather than incremental steps. The 80/20 rule says that, in many situations, a small number of inputs determine the vast majority of our desired results. If we identify these “vital few” inputs in our sustainability efforts, and focus on them, we can maximize our effectiveness and accelerate progress rapidly. 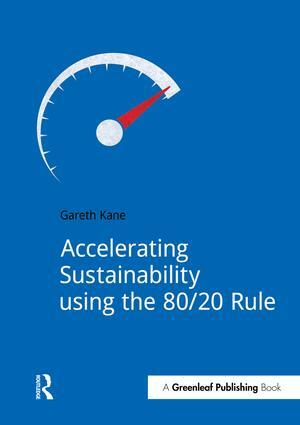 This book will help you to think about sustainability from an 80/20 perspective with practical applications for: product and service development; supply chains; materiality, indicators and quantitative analysis; waste, energy efficiency, water conservation and transport; employee engagement and sustainability strategy. If you want to focus on what works, deliver better results, waste less time on “switch it off” stickers and ineffective “standard practice” and start making a real difference, then this book is for you!